Become a Certified Lionfish Hunter by signing up and completing this class. After certification you will be permitted to cull Lionfish from most of our regular dive trips from Ocean Frontiers' boats. Ocean Frontiers will provide you with use of a licensed sling spear, collection tube and a Thermos of hot water on future dive boat trips. Ocean Frontiers offer a 2-Tank and a 3-Tank option for this certification class. Must be 15 years or older and a certified Open Water Diver or higher. The Red Lionfish were first spotted in Grand Cayman in 2009 and have since established a large and growing population. In January 2010, Ocean Frontiers decided it had reached a point where direct action needed to be taken. The Red Lionfish are eating our native species of juvenile fish and damaging the balance of our fragile coral reef ecosystem. Red Lionfish were introduced to the Caribbean region by mankind and we feel it is our duty to make our best efforts to try and un-ring the bell. 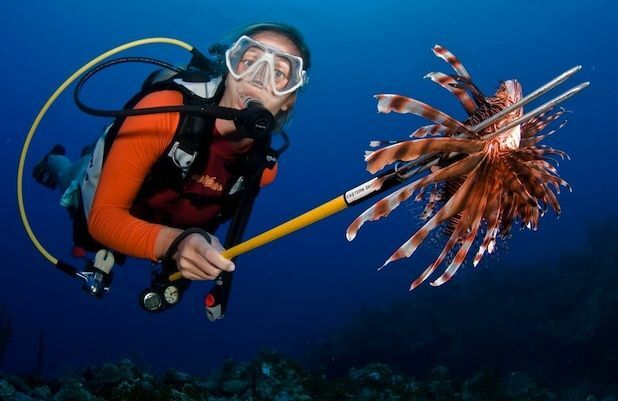 Whilst we don't expect to ever completely remove the Red Lionfish from it's new home in the Cayman Islands, we do need to keep their population in check and do our best as scuba divers to reduce the numbers to a minimal level. Spearing of any other fish on Scuba in the Cayman Islands is prohibited and a violation of the Cayman Islands Marine Conservation Laws.